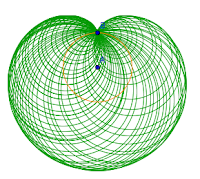 A cardioid is a curve formed by moving circles. One of the ways to form a cardioid is shown below. In the applet (move the slider to the extreme right), the cardioid is given as the envelope of circles whose centers lie on a given circle and which pass through a fixed point on the given circle. 1. Construct point A at (0,0) and point B at (0,1). 2. Construct a circle with center A and passing through B. 3. Construct an angle slider and set the minimum number to 0°, maximum number to 360° degrees and increment of 2°. 4. Construct angle BAB'. To do this, select the Angle with Given Size tool, click on point B and click on point A to display the Angle with Given Size dialog box. 5. In the Angle with Given Size dialog box, replace 45° with α, choose counterclockwise button, and then click OK.
6. Hide the green sector by right clicking it and then clicking on the Show Object from the pop up menu. 7. Now construct a circle with center B' and passing through B. 8. Right click the circle with center B and click Trace on. 9. Move the slider and observe what happens. Good job and thanks for sharing this wonderful article. My Assignment Services, is well-known for its 24-hour online Assignment Help on the WhatsApp platform. Students can reach out to us with their queries at any point of the day or night and get the most effective solutions for them. University assessments have to follow specific referencing and citation styles like Harvard, APA, Chicago and MLA. Also, they should be referenced only from credible academic sources. Our best online academic help experts talk about how to select and evaluate the right academic sources, which will help you clear all your academic-related doubts. Assignment Help UK by My Assignment Services has been trusted by millions of students worldwide for over a decade. We have been providing complete academic assistance to students struggling with their college and university tasks. We have a team of dedicated subject matter experts who maintain a 100% record of submitting orders well before the deadline. This also gives the students some time to review them and ask for revisions, if needed. You can trust our academic ghostwriters completely to get best quality write-ups including case studies, research proposals, dissertations and Assignment Help Melbourne, and more.